Personal: Hometown is Colchester, England...Wife Cassie and son Colby...Enjoys soccer and golf...First job was as a stock market day trader...Bowling hero is Chris Barnes. 2019: Finished fourth in Oklahoma Open losing to Jesper Svensson 267-231 in second stepladder match. Career: In 2018 finished second in season-ending PBA Clash non-title event losing to Marshall Kent in title match 218-215. Won U.S. Open for second major and seventh career title by beating Jakob Butturff 207-206 in title match. Finished fourth in Xtra Frame Parkside Lanes Open losing to Bill O'Neill 245-216 in second stepladder match. Won season opening DHC Japan Invitational for sixth career title with 267-204 win over Kyle Troup in title match. Was member of Sysco Philadelphia Hitmen team that finished second in Oceanview at Falmouth PBA League Elias Cup Finals...In 2017 ended nearly three-year drought by winning Brunswick Euro Challenge defeating Thailand's JoJoe Yannaphon 237-221 in title match for fifth career title. Finished third in FireLake PBA Tournament of Champions losing to Tommy Jones in semifinal match, 248-216. Finished third in Xtra Frame Reality Check Classic losing to eventual winner Josh Blanchard 279-258 in semifinal match...In 2016 finished third in PBA World Championship losing to Tom Smallwood in semifinal match 266-235. Had best finishes of second in DHC Japan Invitational, losing to Amleto Monacelli 255-233 in title match, and sixth in FireLake PBA Tournament of Champions...In 2015 Teamed with Osku Palermaa to finish second in Roth/Holman Doubles losing in championship match 228-203. Finished second in Badger Open, losing to Ronnie Russell 217-187 in championship match. Finished second in U.S. Open losing to Ryan Ciminelli 221-217 in title match...In 2014 successfully defended 2013 Qatar Open title for fourth Tour title by defeating fellow countryman Stuart Williams 395-388 in two-game championship match. Finished second in Brunswick Ballmaster tournament losing to winner Mika Koivuniemi 188-172 in title match. Finished third in Barbasol Tournament of Champions losing to Wes Malott in semifinal match 205-202. Finished second in Kuwait International Open losing to Thomas Larsen 208-205 in championship match...Was member of 2014 Silver Lake Atom Splitters team that won Elias Cup by defeating L.A. X 4-2 in championship finals...In 2012-13 season won WSOB V PBA World Championship for third career title and first major by defeating Sean Rash 238-235 in title match. Became first Englishman and only second international player (Osku Palermaa was first) to win the World Championship. Won second career Tour title by winning Qatar Open defeating Mattias Olsen of Sweden 514-467 in two-game title match...Finished second in WSOB V Chameleon Championship losing to Ryan Ciminelli 258-203 in title match...Won Scorpion Open in his second Tour season for first career title in 2011-12. Defeated Sean Rash 247-204 in championship match to become second English player to win a PBA Tour title (Stu Williams was the first)...Owns two PBA regional titles. 2018 - DHC Japan Invitational. 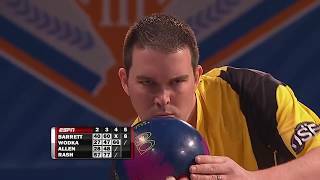 2018 - U.S. Open, Wichita, Kan.
2008, '09, '10 World Bowling Writers Bowler of the Year...Teamed with Mika Koivuniemi, Stuart Williams and Martin Larsen to win 2013 Weber Cup...Won 2016 World Bowling Tour men's final by defeating Mike Fagan 300-256 in championship match.